My "chief photographer", yes, my mum, has gone overseas so I have been limited to 3 board/party/card game reviews per month [compare this tally with last year where I averaged about 5 games per month]. Hopefully I can speed this up when she gets back, but to be honest, I'm not really in a hurry as my collection growth has slowed down considerably (especially as I now know what kinds of games I am after). In the meantime, I would like to spend a bit of time on a few miscellaneous things. First, I will revisit the Asian Cup 2015 and the upcoming World Cup Qualifiers (by upcoming I mean in about 4 months' time). But I will also hopefully get atop other things that I've been meaning to get on to, particularly video game music. I actually think that, bar the defence, this is actually a solid team on the world stage. It's not a great team, but it is competitive. 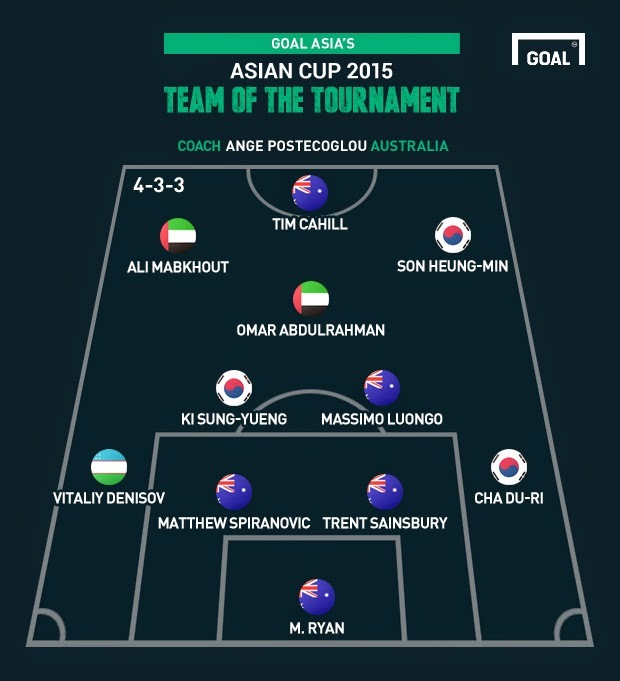 Goal.com seems to have just picked players who made it to the Semi-final, which is not really a fair criteria. Khalil always seemed to be dangerous in the games he played. But to be fair, the 3 strikers depicted above are probably a class above Khalil. He would be a good bench player I think. Honda played fairly well this tournament - he had a few misses in the group matches but apart from that and his penalty shootout miss (a different proposition to a normal penalty) he did quite well. He might arguably be a better fit than Ki, but I suppose Ki is there because he is more of a central midfielder who marshalls the ball into the right areas (ie, he isn't completely attacking minded - he gives the team its stability and heartbeat). I really like Ghoochannejhad. I think he's more of an impact player, one who can make that critical goal happen when you need it the most - he demonstrated this in the 2014 World Cup Qualifiers and this Asian Cup, scoring last-minute goals at least twice. The Japanese defended well this tournament bar that one goal conceded. I think that deserves a big mention, although some would argue that they had the easiest group. Therefore, I would suggest that one or two of their defenders could take the place of those mentioned here - but that is debatable and I don't really want to get into that as I am not overly familiar with them. However I will state quite clearly that I think Cha Du-Ri deserves his spot. A look at the rankings of the Asian teams post-Asian Cup 2015 reveals some interesting concepts. 1. Australia jumped a massive 37 places. This was, at least by my quick count, the second biggest move behind Equatorial Guinea, who jumped 69 places after their Africa Cup of Nations performance. 2. It will be extremely important for Australia to stay in the top 4 in Asia [currently Iran, South Korea, Japan, Oz] over the next 2-3 years during the World Cup Qualifying Campaign for Russia 2018. This is because Round 3 of the World Cup Qualifying Campaign for Asia will involve the Top 2 teams in Asia being seeded into a "Pot A" and the next 2 teams are seeded into Pot B. 1 Team is picked from each pot. So long as Australia are in the top 4 teams, they will only have to play 1 of those 4 teams. It would be disastrous having to play 2 of 4 strong teams (eg. 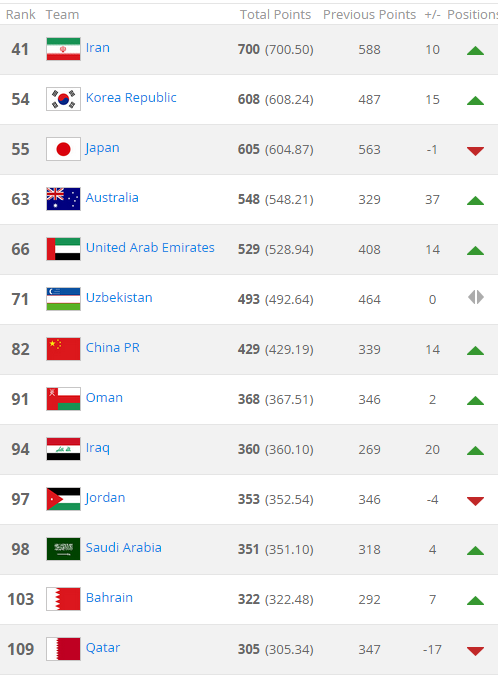 Iran and Japan) if Australia were ranked 5th in Asia or lower. It is, of course, better to be in Pot A as Pot A has a chance of drawing a "weaker strong" team in Pot B. This assumes that between Iran, Japan and South Korea there is a weak link - it is arguable that South Korea is that weak link in terms of consistently producing strong performances. It seems unlikely that the traditional top 3 of Iran, South Korea and Japan will be overthrown. 3. If you think about it, interestingly, Japan and Iran didn't lose any games (in normal or extra time) at the Asian Cup 2015: that's why their rankings are still so high. They each won 3 Group games and drew their knockout game - hence why they still have so many points (you still get points for losing a penalty shootout as it's still considered a draw). 4. On that note, Japan only conceded one goal in the whole tournament - yet they got knocked out almost solely because of that one goal. Amazing. 5. For the time being, in terms of the second round of World Cup Qualification for the AFC, all that matters is that Australia are in the top 10 teams in Asia (as there are 5 Pots, each with 10 teams - being in the 1st pot of 10 means you avoid the other strong guns which is critical as only 1 team per group qualifies automatically). This looks unlikely to change before the draw for the second round of qualifying on 11 April 2015. Jordan is currently sitting at number 10. However, in the long-term, these overall rankings are likely to shift over the next two years as the AFC Qualifiers heat up. Despite their current rankings, I would really like to see UAE, Uzbekistan or China scrape through to the World Cup (not at Australia's expense). 6. Speaking of underdogs and upsets, I do sincerely hope that some "Asian minnows", especially those playing in the first round of World Cup Qualifying, can break out from that status. For example, how long do India or China have to wait before they can claim the powerhouse titles they so arguably "deserve" (based on population)? Australia's time to shine again as they are co-hosts? NZ look like decent value for money, being joint hosts and a dark horse of sorts. I can't believe that 10% of all bets so far have been on the UAE LOL. As my dad says, if you bet $1 on the UAE, Scotland or Afghanistan, you may as well just give it to charity. That may be true but I do recall the odds of Costa Rica topping their difficult World Cup 2014 Group being quite high ($70 or so?) but I suppose that was a much easier feat compared to winning the whole thing. That's all for the time being. Hopefully I'll get Word on the Street, a fantastic game, out in a week or two.